Internal communications can be challenging in any type of industry or organization. But if you work in an industry where your staff aren’t located in a traditional office building, reaching them and ensuring they are kept up-to-date and in the loop with important corporate information can be especially challenging. Non-traditional workplaces are increasing as a result of globalization, 24/7 business culture, the rise of the gig economy and a desire by employees to seek more flexible working arrangements – which makes this problem increasingly more common. According to the New York Times, in 2016, 43 per cent of American employees spent at least some time working remotely. It’s predicted that half of all employees will work remotely at least some of the time by 2020. Whether your workforce are engaged in roles such telecommuting from a home office or co-working space, driving trucks, cleaning, working on construction sites, servicing sales clients in the field, working in retail operations or in hospitality, reaching them is not always straightforward. Despite the world being connected 24/7, that doesn’t mean that the right messages are getting through to the right people, in the right way, at the right time. You may have additional hurdles and obstacles, such as being a global organization that operates in different countries and different time zones and different cultures. Many of these types of workers don’t even have a company email address, or access to a computer to check emails on during the day. They aren’t sitting at computers all day long like their office worker colleagues. Given that most corporate communicators rely on email or using their company’s intranet site to send information to their workforce, this disenfranchises those who cannot easily access this. These workers can also miss out on other types of workplace communication such as face-to-face meetings, brainstorming, video conferences, water cooler banter and even on-site visual communications like posters, screensavers and other printed material. It shouldn’t come as a surprise, then, that it’s not uncommon for these workers who aren’t on-site to feel a disconnect with their company. According to the State of Remote Work Report 2018, 21 per cent of remote workers found collaboration and communication to be one of the biggest struggles in the way they work. The result of this can be decreased productivity, lower rates of satisfaction, high levels of staff turnover, mistakes being made and misinformation given to clients. Conversely, strengthening communication with these employees can lead to improved levels of collaboration, productivity and customer satisfaction. These workers can often feel as though they are out of the loop, which makes them feel as though they aren’t a real part of the team and, as a result, are off message in all their interactions with clients – your stakeholders. If your workforce comprises of any hard-to-reach workers, finding ways to keep them in the information loop should be a priority. Plan how you will reach out to them, determine the best communications channels for the job, and ensure you are sending them timely information so they can feel more included and consulted. DeskAlerts is an internal communication solution that many companies around the world are turning to in a bid to revolutionize their internal communications. The software has a range of uses – primarily it can be used to send pop-up notifications straight to the desktop screens of employees, cutting through digital noise and clutter that can be a barrier to effective communication. If your remote employees or those who are working in the field have a computer that they use for any aspect of their work, you can install the DeskAlerts client on their machine – even if they don’t use it for email and traditional office software. 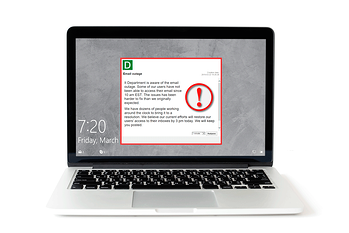 DeskAlerts is compatible with both Windows and Mac operating systems and the messages that are sent will appear on top of whatever else the employees are working on at the time. These messages appear in a way that can’t be skipped, ignored or minimized. For example you can send retail staff critical notices about inventory issues or when they can expect deliveries. All employees can be sent information about system outages, price rises, important corporate news and so on. The built in metrics tool at the back end of DeskAlerts will let you see who has seen your messages and who hasn’t – giving you peace of mind that your important communications have been seen. As for those employees who don’t use computers at all, you can still use DeskAlerts to reach them - they will most likely have smart phones, tablets and other mobile devices. DeskAlerts has a mobile client app that lets you reach those employees who aren’t always able to check emails. You can use this system to push alerts and employee surveys to your employees’ Android and iOS devices. Whether they work in the field full-time or are away from the office on business, they can always stay connected with your corporate news. You can integrate mobile alert system applications via mobile device management solutions which can support any bring your own device (BYOD) policy or practice that your organization has in place. 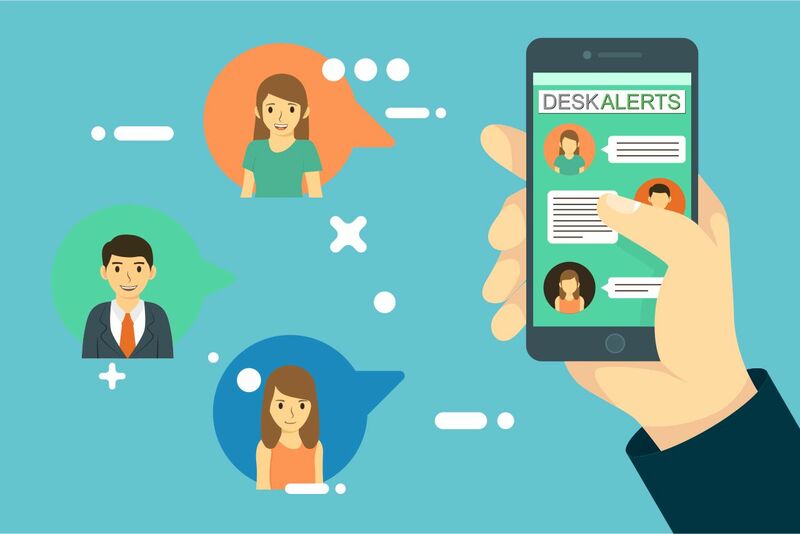 In addition to the app, DeskAlerts can also be used as an SMS alert system – allowing you to deliver text message alerts to your employees, no matter where they are. DeskAlerts features an integration interface that enables you to send mobile text alerts to your employees via your telecommunications provider. With both the app and the SMS alerts, you can add URLs to your messages and direct your employees to the internet to read more information so you are able to convey more detailed or complex information.